North Korean leader Kim Jong-Un sent a brief message of congratulations to Xi Jinping on Oct. 25 after the Chinese leader was elected as general secretary of the Central Committee of the Communist Party of China at the 19th party congress. The message “expressed the conviction that the relations between the two parties and the two countries would develop in the interests of the peoples of the two countries,” according to the state-run Korean Central News Agency (KCNA). In what analysts said was a sign of strained relations between the two countries, North Korea sent a much shorter message this time than it sent in 2012 when Xi was first elected as the party’s general secretary. Kim’s message also left out North Korea’s assessment of the two nations’ traditional ties, Yonhap reported. But the message also marked the first time since February that North Korea’s state media mentioned Xi in its reports. The ruling Workers’ Party of North Korea last week sent a relatively short congratulatory message to China on the opening of the party congress. “North Korea’s ties with China, its main ally and economic benefactor, have been frayed over Pyongyang’s persistent advancement of its nuclear and missile programs,” the Yonhap report said, noting China has implemented UN sanctions on North Korea over its nuclear and missile tests. 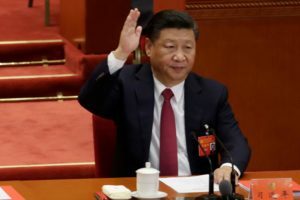 Xi’s name and ideology were enshrined in the country’s constitution, elevating his status to that of Mao Zedong, as China wrapped up the week-long party congress on Oct. 25, during which Xi cemented his power as he entered his second five-year term.